For other uses, see Grand Duchess Maria of Russia (disambiguation). Grand Duchess Maria Alexandrovna of Russia (later Duchess of Edinburgh and Duchess of Saxe-Coburg and Gotha; Russian: Мари́я Алекса́ндровна; 17 October [O.S. 5 October] 1853 – 24 October 1920) was the fifth child and only surviving daughter of Emperor Alexander II of Russia and his first wife Princess Marie of Hesse and by Rhine. She was the younger sister of Emperor Alexander III of Russia and the paternal aunt of Russia's last Emperor, Nicholas II. In 1874, Grand Duchess Maria Alexandrovna married Prince Alfred, Duke of Edinburgh, the second son of Queen Victoria and Prince Albert of Saxe-Coburg and Gotha; she was the first and only Romanov to marry into the British royal family. 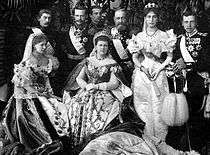 The couple had five children: a son, Alfred, and four daughters: Marie, Victoria Melita, Alexandra, and Beatrice. For the first years of her marriage, Maria Alexandrovna lived in England. She neither adapted to the British court nor overcame her dislike for her adopted country. She accompanied her husband on his postings as an Admiral of the Royal Navy at Malta (1886 -1889) and Devonport (1890–1893). The Duchess of Edinburgh travelled extensively through Europe. She visited her family in Russia frequently and stayed for long periods in England and Germany attending social and family events. In August 1893, Maria Alexandrovna became Duchess of Saxe-Coburg and Gotha when her husband inherited the duchy on the death of his childless uncle, Ernest II, Duke of Saxe-Coburg and Gotha. She enjoyed life in Germany where she was active in cultural endeavours and charitable work. To her daughters, she gave all her support, but she was critical of her wayward son who died young in 1899. Her husband died the following year. In her widowhood, Maria Alexandrovna continued to live in Coburg. The outbreak of World War I divided her sympathies. She sided with Germany against her native Russia. Her only surviving brother, Grand Duke Paul, her nephew Tsar Nicholas II and many other relatives were killed during the Russian Revolution and she lost her considerable fortune. From 1893 until her death, she had the distinction of being a Russian grand duchess (by birth), a British princess and royal duchess (by marriage), and the consort (and later widow) of a German sovereign duke. After World War I, Saxe-Coburg-Gotha, the duchy her husband and nephew had ruled, ceased to exist in November 1918. Maria Alexandrovna died two years later while living under reduced circumstances in exile in Switzerland. From left to right: Grand Duchess Maria Alexandrovna, Tsar Alexander II with Grand Duke Sergei in his lap, Grand Duke Vladimir, Grand Duke Alexander on the table with his arms crossed, Grand Duke Alexei and Tsarevich Nicholas Alexandrovich. Grand Duchess Maria Alexandrovna was born on 17 October [O.S. 5 October] 1853 at the Alexander Palace in Tsarskoye Selo. She was the sixth child and only surviving daughter among the eight children of Emperor Alexander II of Russia and his first wife Empress Maria Alexandrovna of Russia, née Duchess Maximilienne Wilhelmine of Hesse-Darmstadt. At the time of her birth, her grandfather, Emperor Nicholas I of Russia, was on the throne and her father was Tsarevich. In 1855, when Maria Alexandrovna was seventeen months old, Nicholas I died and her father became the new Russian Emperor. The grand duchess grew up as the only girl with four older brothers and two younger ones. She did not know her only sister, Grand Duchess Alexandra Alexandrovna of Russia, who had died before she was born. Maria Alexandrovna herself almost died from a throat disease at the age of seven. Grand Duchess Maria Alexandrovna of Russia in her youth. Her childhood was spent in luxury and splendor in the large palaces and country estates owned by the Romanovs. The family's main residence was the sixteen-hundred-room Winter Palace in Saint Petersburg, with another residence at Gatchina, forty miles south. In the summer, the family stayed in Peterhof, a large complex with farms, cottages, and various pavilions on the Gulf of Finland. From the end of the summer until winter, the Imperial family moved to Tsarskoye Selo, the royal village, where the Romanovs had the Catherine Palace and Alexander Palace. In the children's island, located in a pond in the park of the Alexander Palace, Maria Alexandrovna had her own private little house, off limit to adults, which she used with her brothers as a playhouse. Her father added a farm, built for her enjoyment when she was eight years old. Both parents doted on her; for Tsar Alexander II, she was her favourite child and he enjoyed spending time with her. The Empress was a loving mother, but physically cold towards her children. The Tsarina suffered from weak lungs and had to travel constantly to Germany and southern Europe to escape the harsh Russian winters. The Tsarina often took her three younger children with her on these trips. As a consequence, Maria Alexandrovna became closer to her two younger brothers, Grand Duke Sergei and Grand Duke Paul Alexandrovich, than to her older siblings. Surrounded only by brothers, Maria grew up as a tomboy, with an independent character and a strong will. Grand Duchess Maria Alexandrovna wearing the traditional dress of ladies of the Russian Imperial court. Maria was educated at the Russian court under the strict regime of her governess, Countess Alexandrine Tolstoy. Maria Alexandrovna was the first Russian grand duchess to be raised by English nannies and to speak fluent English. Besides her native Russian, she also became totally proficient in German, French, and English. In August 1867, while the Imperial family was at Livadia Palace, in Crimea, Mark Twain met Maria Alexandrovna and her parents. The famous American writer described her as "blue-eyed, unassuming, and pretty". As many contemporaries did, Twain noticed the influence that the young grand duchess had over her father. "She is absolutely genuine and never changes in front of strangers," observed her maiden of honor Anna Tyutcheva (1829–1889), a daughter of the celebrated poet Fyodor Tyutchev, adding that: "She is accustomed to be the center of the world and that everyone yields to her." Tyutcheva described her pupil as "stubborn and uncompromising" commenting that "one cannot treat her roughly or reason with her a lot". Grand Duchess Maria Alexandrovna and Prince Alfred around the time they met. 1868. During a visit to her maternal relatives at Jugenheim, in August 1868, Grand Duchess Maria Alexandrovna, then fifteen years old, met Alfred, Duke of Edinburgh. Prince Alfred, Queen Victoria's second son, was a shy and handsome young man, with a career in the British navy. He was visiting his sister, Princess Alice, who was married to Maria Alexandrovna's first cousin. Alfred's voyage around the world with the Royal Navy kept him away, traveling for the next two years. Maria and Prince Alfred saw each other again in the summer 1871, when Alexander II and his wife visited relatives at Schloss Heiligenberg. The Tsar and his wife were accompanied by seventeen-year-old Maria and her two elder brothers. Alfred also happened to be there, along with the Prince and Princess of Wales. During that summer, Maria and Alfred felt attracted to each other, spending their days walking and talking together. They had a common love of music; Alfred was an enthusiastic amateur violinist, while Maria played the piano. Although they wished to marry, no engagement was announced, and Alfred returned to England. Their parents were against the match. Alexander II did not want to lose his daughter, to whom he was deeply attached. The Tsar also objected to a British son-in-law, due to the general anti-English feeling in Russia following the Crimean War. The Tsarina regarded the British customs as peculiar and the English people as cold and unfriendly. She was convinced that her daughter would not be happy there. However, marriage negotiation began in July 1871, only to be stalled in 1872. Grand Duchess Maria Alexandrovna and Prince Alfred. Engagement photograph, 1873. Queen Victoria was also against the match. No British prince had ever married a Romanov, and she foresaw problems with Maria's Orthodox religion and Russian upbringing. The Queen considered that Russia was generally "unfriendly" towards Britain. Victoria was also suspicious about Russian moves in the direction of India. The Queen was dismayed, therefore, when she heard that official negotiations had restarted in January 1873. There were rumours going about St Petersburg that Maria Alexandrovna had compromised herself with Prince Golitsyn, the Tsar's aide-de-camp, and her family were anxious to see her settled. Alfred refused to believe those rumours and he was prepared to fight to marry the person he loved. Queen Victoria therefore swallowed her pride and said nothing. Both mothers continued to look for other partners for their children, but Alfred and Maria would not have anyone else. As the Tsarina failed to find a German prince acceptable for her daughter, a meeting among Alfred, the Tsarina and her daughter took place in Sorrento, Italy in mid April 1873. That year, there was an Anglo-Russian dispute over the Afghan border. The Queen’s ministers thought that a marriage might help to ease the tension between the two countries, if only by putting the monarchs into closer contact with one another. In July 1873, Alfred went to Jugenheim to meet the Tsar. On 11 July, he asked for Maria Alexandrovna's hand and she accepted him. He was nearly twenty-nine; she was nineteen. He sent a telegram from Germany back to his mother: "Maria and I were engaged this morning. Cannot say how happy I am. Hope your blessing rests on us." The Queen sent her congratulations, but confined her misgivings to her diary on 11 July 1873: "Not knowing Marie, and realizing that there may still be many difficulties, my thoughts and feelings are rather mixed." When breaking the news to her eldest daughter, Crown Princess Victoria of Prussia, Queen Victoria simply said: "The murder is out." Tsar Alexander II granted his daughter the then staggering sum of £100,000 as a dowry, plus an annual allowance of £32,000. He also bestowed upon on his only daughter some of the best jewels owned by the Romanovs, including the sapphires he had inherited from his mother, Empress Alexandra Feodorovna, as well as a parure that had belonged to Catherine the Great. As a wedding present, the Tsar commissioned a complete parure of diamonds and Burmese rubies from the court jeweler Bolin. Her other pieces of jewelry included a tiara russe made of diamonds, which could also be worn as a necklace. On his part, Alfred, was made honorary chief of a Russian guards regiment and even had a Russian battleship named after him – the Herzog Edinburgsky. A week after the engagement, the proposed Anglo-Russo alliance experienced its first crisis. Queen Victoria asked the Tsar to bring Maria to Scotland, so that she could meet her future daughter-in-law. Alexander II refused. The Tsarina suggested that they all meet in Cologne, instead. The Queen called it "simply impertinent" that "I ... who have been nearly twenty years longer on the throne than the Emperor of Russia ... and who am a Reigning Sovereign ... should be ready to run to the slightest call of the mighty Russians ... like any little Princess." Victoria also made herself unpopular by refusing the Tsar’s offer to make the Prince of Wales colonel of a Russian regiment, and by demanding that an Anglican marriage service be held in St Petersburg alongside the Orthodox ceremony. But Maria Alexandrovna looked forward happily to her marriage: "How happy I am to belong to him. I feel that my love for him is growing daily. I have a feeling of peace and inexpressible happiness and a boundless impatience to be altogether his own." The wedding of Grand Duchess Maria Alexandrovna and Prince Alfred at the Winter Palace. 23 January 1874. On 4 January 1874, Alfred arrived in St Petersburg for the wedding and stayed in the Winter Palace. The other British guests arrived on 18 January. The wedding was celebrated in great splendour, at the Grand Church of the Winter Palace on 23 January [O.S. 11 January] 1874. Queen Victoria was represented by her eldest son Albert Edward, Prince of Wales, and his wife Alexandra, Princess of Wales, sister of Tsarevna Maria Feodorovna of Russia. The Queen's eldest daughter, Victoria, and her husband Frederick, Crown Prince of Germany, were present as well. The marriage ceremony consisted of two parts. The Orthodox service took place first and was performed by the Metropolitans of St Petersburg, Moscow, and Kiev in the Imperial Chapel. Grand Dukes Vladimir, Alexis, and Serge and the groom's brother Prince Arthur, Duke of Connaught and Strathearn, relieved each other taking turns holding the golden crowns over the head of the bride and groom. Maria wore a glittering coronet and a mantle of crimson velvet trimmed with ermine and a sprig of myrtle, specially sent by Queen Victoria. Alfred wore the uniform of the Royal Navy. The Tsar looked pale throughout the entire ceremony and said afterwards: "It is for her happiness, but the light of my life has gone out." After this, the bride and groom each drank thrice from a goblet of wine. The service concluded with the couple joining hands under the priest’s stole. Then they all proceeded to the Alexander Hall, where Arthur Stanley, Dean of Westminster, made Prince Alfred and Maria Alexandrovna man and wife according to the rites of the Church of England. In London that night, Queen Victoria wore the Order of St Catherine on her dress and drank a toast to the young couple. Those members of her court who had traveled to St Petersburg were overwhelmed by the scale of the celebrations, receptions and entertainments marking the Anglo-Russian marriage. Major-General Sir Howard Elphinstone noted that, in one room, supper was served to five hundred people at fifty different tables, with "palms and exotics ... used to so large an extent that it gives the place the appearance of a conservatory ... the heat of the rooms was almost unbearable, and several ladies left the ballroom in a fainting state." Lady Augusta Stanley summed up the wedding in three words: "What a day." Alfred and Maria spent their wedding night at the Alexander Palace in Tsarskoe Selo. Alexander II had ordered a lavish honeymoon suite on the ground floor, hoping that it would persuade the young couple to remain in Russia. After a short honeymoon in Tsarskoe Selo, however, Alfred and Maria left Russia to live in England. Alexander II never lost hope that they would return, and the honeymoon suite was kept preserved for the couple for two decades. It later became the bedroom of the last Tsar, Nicholas II, and his wife Alexandra, in 1894. The Duke and Duchess of Edinburgh arrived in England on 7 March 1874. The town of Windsor was decorated in their honour, with Union Jacks and Russian flags, and Maria was given a great welcome by the waiting crowds. Queen Victoria met them at the South-Western Station and recorded their arrival in her journal: "I took dear Marie in my arms and kissed her warmly several times. I was quite nervous and trembling, so long had I been in expectation ... Dear Marie has a very friendly manner, a pleasant face, beautiful skin and fine bright eyes ... She speaks English wonderfully well." Later on, Queen Victoria described her new daughter-in-law as "most pleasing natural, unaffected and civil" even if "she was not pretty or graceful and held herself badly". "I have formed a high opinion of her," Queen Victoria reported, impressed with "her wonderfully even, cheerful, satisfied temper – her kind and indulgent disposition, free from bigotry and intolerance, and her serious, intelligent mind – so entirely free from everything fast – and so full of occupation and interest in everything, makes her a most agreeable companion. Everyone must like her." The queen also noted that Marie was "not a bit afraid of Affie and I hope will have the very best influence upon him." The Duke and Duchess of Edinburgh made their public entry into London on 12 March. Thousands lined the route from Paddington Station to Buckingham Palace to take a glimpse of the new British Princess Alfred and Maria moved into Clarence House in London, which was their main residence in England. In addition, they had a country residence, Eastwell Park, a large estate of 2,500 acres near Ashford in Kent, where the Duke enjoyed shooting parties. To alleviate his daughter's homesickness, the Tsar and his son Grand Duke Alexei paid a family visit to England in May 1874. Maria arrived in England with the intention of making a success of her life in her adopted country, but she found difficult to settle at the British Court. For her, the climate was detestable, and the food bland. She found Clarence House, her London home, "gloomy". She described London as "an impossible place, where people are mad of pleasure" and a let down compared to the broad streets, golden domes, and magnificent palaces of Saint Petersburg. In her eyes, Buckingham Palace and Windsor Castle could never compete with the splendours of the Winter Palace. Constant visits to her mother-in-law at Windsor Castle and Osborne in the Isle of Wight were tedious. The Queen's company was oppressive, the late nights were tiring, and her husband was a philanderer. Of her sisters and brothers-in-law, she only cared for the two youngest: Prince Leopold and Princess Beatrice. Proud of her strong intellect, she considered Alexandra, the Princess of Wales, a light-minded and foolish woman. Although she loved music, the duchess did not like the Royal Albert Hall, describing it as "all ecclesiastical and ... quite boring ... Every concert goes on for several hours”. When she visited Scotland, Maria Alexandrovna was frozen in her unheated bedroom in Balmoral Castle and ordered a fire to be lit. When she was out, Queen Victoria entered the room and ordered a maid to throw water on the fire and open all the windows. The Duchess was soon writing letters home to her father describing Queen Victoria as a "silly obstinate old fool". Disenchanted with Britain and life with her difficult mother-in-law, the Duchess of Edinburgh became increasingly homesick for Russia and was happy for any excuse to return there. British people thought her rough and masculine in her manners. Her imperious attitude towards her servants and her defiance of English convention by smoking in public made her unpopular. She made it equally plain that she did not care what people thought. Queen Victoria, The Duchess of Edinburgh and Princess Beatrice. The Duchess often squabbled with her mother-in-law on how she should be addressed at court. As the Tsar’s only daughter, Maria Alexandrovna had precedence over all the Grand Duchesses in Russia. She therefore deeply resented having to give precedence in England to the Princess of Wales. From her birth, Maria Alexandrovna was an Imperial Highness as the daughter of an Emperor. However, once she married her husband she was only entitled to the style of Royal Highness. Tsar Alexander II alleged that his daughter should continue to be styled as an Imperial Highness, not royal, "as in all civilized countries". Queen Victoria replied that she did not care whether imperial was used or not, as long as royal came first. There was also the added problem that Maria was both Duchess of Edinburgh and Grand Duchess of Russia, and which title should be written first. In retaliation for the quarrel over precedence, the Duchess of Edinburgh took great pleasure in showing off her magnificent jewellery. The English princesses were clearly jealous of her diamonds, as was Queen Victoria. Meriel Buchanan, daughter of the last British ambassador to Imperial Russia, described Maria’s first Drawing Room: "The Queen compared the Duchess’s tiara with those of her own daughters, shrugging her shoulders like a bird whose plumage has been ruffled, her mouth drawn down at the corners, in an expression which those who knew her had learned to dread." The Duke and Duchess of Edinburgh quickly started a family. Just nine months after their marriage, the Duchess gave birth to a son, young Alfred, born in Buckingham Palace on 15 October 1874. The Tsarina came to London to visit her daughter during her confinement and to meet her grandson. In the following years, the family kept growing. A daughter was born on 29 October 1875 at Eastwell Park. She was named Marie, after her mother and grandmother. Maria shocked English society by nursing the children herself. The family's main residence in England was Clarence House, in London. Autumns, Christmas and new year were spent at Eastwell Park, a country estate they leased in Kent. On summer holidays, the family went to Osborne Cottage on the Isle of Wight. While the Duchess was in Malta accompanied her husband, who was stationed there as an officer in the Royal Navy, Maria Alexandrovna gave birth to a second daughter, Victoria Melita, on 25 November 1876. After their return to their sojourn in Malta, in 1877, Russia went to war with Turkey in an attempt to gain control of the Balkans. Queen Victoria sent Tsar Alexander II a series of aggressive telegrams that almost led to a state of war between the two countries. The Duchess was deeply shocked at her mother-in-law's hostility towards her country and her own father in particular. The relationship between the Duchess of Edinburgh and her mother-in law deteriorated. Maria Alexandrovna became an Anglophobe. The Duke of Edinburgh was the heir of his childless uncle Ernest II, Duke of Saxe-Coburg, the eldest brother of Prince Albert. After the Russo-Turkish War of 1877–1878, for a long while, Maria Alexandrovna resided in Coburg, as her husband was expected to succeed his aging uncle. While in Germany, a third daughter, Alexandra, was born on 1 September 1878 at Rosenau Castle, in Coburg. On 13 October 1879 the Duchess gave birth prematurely to a stillborn son at Eastwell Park. On 17 February 1880, Maria was back in Russia, during the 25th anniversary celebration of her father's coronation. That day, radicals attempted to assassinate the Tsar and the entire Imperial family. A terrorist bomb demolished the dining room and the guard room at the Winter Palace. Maria Alexandrovna returned to Russia again in June 1880, to be with her dying mother. She was back in England at Clarence House when her father was killed by a terrorist bomb. Maria Alexandrovna had to rush back to Russia to attend her father's funeral in Saint Petersburg in March 1881. The Duke and Duchess of Edinburgh were present at the coronation of her brother, Tsar Alexander III, in Moscow in May 1883. Their family was completed with the birth of a fourth daughter, Princess Beatrice, born at Eastwell on 20 April 1884. Years later, the Duchess lamented her failure to have more children: "The only real heavenly moment is the birth of the child. This cannot be compared to anything else. I think if I had even a dozen children I would have kept the same feeling." 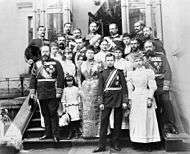 In July 1884, they traveled to Ilinskoe, outside Moscow, to visit Maria’s younger brother Grand Duke Sergei, who had married Queen Victoria’s granddaughter Elisabeth of Hesse. Alfred was heir to the Duchy of Saxe-Coburg and Gotha. Expecting to be the Duchess there, Maria Alexandrovna had a palace built for her family in Coburg. The building, known as the Edinburgh Palais, was built across the central square from the Schloss Ehrenburg, the official residence of the reigning duke, and next to the town's opera hall. The royal couple's rooms were on the second floor, while the bedrooms of the four young princesses were on the third floor. Both the Duke and Duchess of Edinburgh were avid collectors. In the Edinburgh Palais, there were many objects that reminded Maria Alexandrovna of her homeland. As a reminder of Russia, Maria Alexandrovna organised entertainment in the Russian fashion. The Duke and Duchess of Edinburgh with their five children, and Prince George of Wales, Prince Maximilian of Baden, and Grand Duke Ernest Louis of Hesse. Coburg, 1890. In January 1886, the Duke was appointed commander-in-chief of the British Mediterranean Fleet, based in Malta. In October 1886, the family settled there. For the next three years, they spent every winter at the San Anton Palace in Malta. Life in the island was unexciting for the Duchess of Edinburgh, but it was a welcome respite from living in England. While in Malta, the Duchess proved to be an excellent hostess, entertaining naval officers and their wives. In 1887, the couple returned briefly to London to take part in Queen Victoria's Golden Jubilee. Her husband's career in the British navy and their many relations in the European courts allowed Maria Alexandrovna to travel extensively, something that she truly enjoyed. She visited most European countries, including Spain, Italy, the Netherlands, Greece, and even Montenegro, making annual trips to Germany, England, and Russia. In March 1887, the Duke relinquished his command of the Mediterranean Fleet, and the family moved to Coburg. Their main residence was the Palais Edinburgh, where the Duchess held court. Her husband, occupied with his naval affairs, was away most of the time. Responsibility for the education of the couple's five children fell upon the Duchess. She was a strict, but devoted mother who made sure to be the most important person in her children's lives. Between August 1890 and June 1893, the Duke was stationed at the Royal Navy's base in Devonport. Maria Alexandrovna did not care for the Admiralty House, her husband's official residence, and only made rare visits to Devonport with her children. With the passing of the years, Alfred and Maria grew apart. They had little in common other than a shared interest in music and their children. He was reserved, taciturn, moody, ill-tempered, and a heavy drinker. By the mid 1880s he was an alcoholic. The Duke was described as "rude, touchy, willful, unscrupulous, improvident, and unfaithful." The Duchess resented her husband's attitude, but kept her marriage going, hiding her troubled married life from her children, providing a happy environment for them. She later confessed to one of her daughters that she felt she was never anything more than her husband's "legitimate mistress". Arguments over their children added to the couple's marital problems. The Duke hoped that their eldest daughter, Marie, would marry his nephew, the future King George V. The Duchess, however, was determined that her daughter should avoid her mistake, and married her instead to Crown Prince Ferdinand of Romania on 10 January 1893. The Duke and Duchess of Saxe-Coburg and Gotha with family members at Young Affie's majority. On the death of his uncle, Ernst II, Duke of Saxe-Coburg and Gotha, on 22 August 1893, the Duke of Edinburgh inherited the vacant duchy (his elder brother the Prince of Wales had renounced his right to the succession). Upon her husband's ascension to the Ducal throne, Maria Alexandrovna became Duchess of Saxe-Coburg and Gotha, in addition of being Duchess of Edinburgh. Unlike her husband, disgruntled to leave his career in the navy, Maria Alexandrovna thoroughly enjoyed her new role. She found the country "charming" and the prospect of "a new fine position, with plenty to do" a "real God-send". Known for its hunting forest and picturesque castles, the ducal estate was small, compromising separate lands in Coburg, Gotha, Upper Austria, and Tyrol, but there she could live according to her desires in a domain of her own. The family moved to Schloss Ehrenburg, the Duke's official residence, but they all preferred their summer house, Schloss Rosenau, a gingerbread-yellow villa on a hill with views of the surrounding countryside. They also had two residences in Gotha, where they had to live part of the year: Schloss Friedenstein and Schloss Reinhardsbrunn, which the Duke enjoyed for its hunting grounds. The Duchess took on updating the badly furnished castles, and also charitable works, opening an establishment for the mentally challenged that bore her name. Her passions were the opera and the theater, which she supported both in Coburg and in Gotha. The Duchess was also an avid reader and enjoyed mushroom hunting. 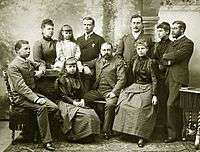 The Duke of Saxe-Coburg and Gotha with his family. 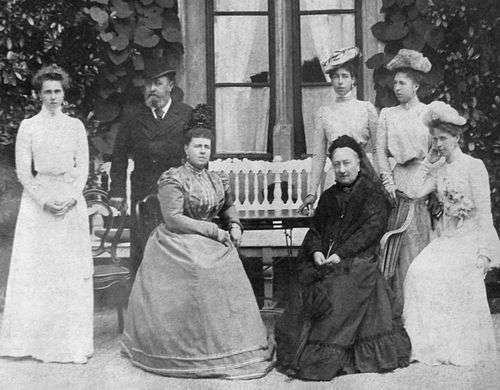 From left to right: Princess Beatrice, Alfred Duke of Saxe-Coburg Gotha, Duchess Marie, Dowager Duchess Alexandrine, Princess Victoria, Princess Alexandra and Princess Marie at Rosenau. Alfred and Maria’s second daughter, Victoria Melita, married Ernest Louis, Grand Duke of Hesse on 19 April 1894. The Duchess was initially against this match as Ernest was close to his British grandmother, Queen Victoria, who arrived at Coburg with many other royals for the wedding. In November 1894, Marie's eldest brother, Tsar Alexander III, died of nephritis, aged forty-nine, leaving his twenty-six-year-old son, Nicholas II, as the new Tsar. Alfred and Maria went to Russia, arriving just before Alexander III's death. They stayed on in Saint Petersburg for the wedding of Nicholas to his fiancée, Princess Alix of Hesse-Darmstadt, the youngest surviving daughter of Alfred's deceased sister, Princess Alice. Over her husband's objections, the Duchess arranged the marriage of her third daughter, Alexandra, in September 1895, to Prince Ernest of Hohenlohe-Langenburg, a grandson of Queen Victoria's half-sister Feodora. He was an attaché at the German Embassy in London and his family was not a reigning royal family. The Duchess's main concern was her wayward only son, Young Alfred, who had a checkered career in the German army. On 15 October 1895, he reached his majority, but he was already suffering from bad health. Alexandra's wedding took place in Coburg in April 1896, and the following month, Maria Alexandrovna travelled to Russia with her husband and their other four children for Tsar Nicholas II's coronation in Moscow. In June 1897, the Duchess and her husband went back to London to take part in Queen Victoria's Diamond Jubilee. By then, the couple's relationship had deteriorated further. Maria Alexandrovna despaired in finding a topic of conversation with her difficult husband as he hated her interest in literature and the theater, while she found his fondness for politics and hunting "dull". The Duchess was relieved when her husband was away. She wrote to her eldest daughter "if only you knew how easy and comfortable life is without him." By 1898, the Duke's health had deteriorated, exacerbated by his excessive smoking and heavy drinking. The Duke and Duchess of Saxe-Coburg and Gotha with their three eldest children, and two sons-in-law, during the coronation of Tsar Nicholas II in Moscow, 1896. On 23 January 1899 Maria Alexandrovna and her husband celebrated their 25th wedding anniversary at Schloss Friedestein, the Duke's official residence in Gotha. Absent from the festivities was their only son, who was gravely ill. Young Alfred was a junior officer in Potsdam, where his chief hobbies were gambling, drinking and womanizing. He had contracted syphilis in 1892, and by 1898, his health deteriorated rapidly. He died at the age of twenty-four on 6 February 1899 in Meran after reportedly shooting himself at Gotha during his parents' wedding anniversary celebrations. :11 The Duke was heartbroken at young Alfred’s death. This tragedy drove the parents farther apart as Alfred blamed his wife, who had been responsible for young Alfred's education. In her grief, the Duchess sank to her knees sobbing uncontrollably during her son's funeral. With the death of Young Alfred, the heir to the Duchy of Saxe-Coburg and Gotha was Alfred's nephew, Charles Edward, Duke of Albany, who came to Germany to be educated there. The succession to the Duchy was complicated by the news that Alfred himself had cancer of the throat, too advanced for any treatment. By May 1900, he was unable to swallow and could only be fed by a tube. The Duchess and their youngest daughter, Beatrice, who were in England visiting Queen Victoria, returned on 17 July, unaware of the seriousness of the Duke's condition. On 30 July 1900, he died in his sleep at Schloss Rosenau in Coburg. Maria Alexandrovna was at his bedside with their daughters Victoria Melita, Alexandra, and Beatrice. Maria became Dowager Duchess of Saxe-Coburg and Gotha. 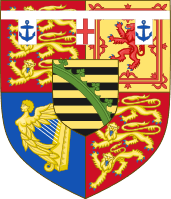 The duchy went to Alfred's nephew Charles Edward, then sixteen years old. During his minority the regency fell on Maria's son-in law, Ernest of Hohenlohe-Langenburg, for nearly five years. Maria Alexandrovna was only forty-six years old when she became a widow. After the death of her husband, she stayed, for a while, in England, where she had to relinquish Clarence House which was inherited by her brother-in-law, the Duke of Connaught. Maria Alexandrovna was at Osborne during the final days of her mother-in law, Queen Victoria. In her widowhood, Maria Alexandrovna kept the Edinburgh Palace as her home in Coburg, and Schloss Friedenstein in Gotha. Schloss Rosenau served as her country residence. However, she spent most of her time at her villa in Tegernsee overlooking a lake in Bavaria, near Munich. Her winter residence was the Château de Fabron, near Nice. The upkeep of five residences put a strain on her finances. Although she was critical of her daughters, she supported them during their personal crisis. In 1901, her second daughter Victoria Melita divorced her husband and came to live with her. On 25 September 1905, Victoria Melita married her maternal first cousin, Grand Duke Kiril Vladimirovich of Russia. The Dowager Duchess's relationship with her nephew, Tsar Nicholas II, deteriorated as he opposed Victoria Melita's second marriage and doomed the romance between Princess Beatrice and his younger brother, Grand Duke Michael Alexandrovich, because they were first cousins. Maria Alexandrovna lamented that, after working hard for the Duchy of Saxe-Coburg, and clearing its finances, the duchy passed to Charles Edward who took control of the Duchy at his majority in July 1905. 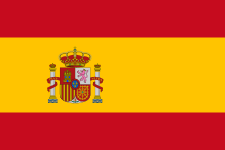 Relations with the new Duke were initially tense, but improved when Charles Edward provided his full support to the marriage of Maria Alexandrovna's youngest daughter, Princess Beatrice to Alfonso de Orleans y Borbón, Infante of Spain on 15 July 1909. 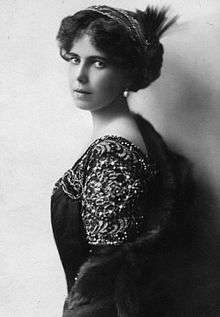 In the following years, Grand Duchess Maria Alexandrovna continued to make frequent trips to her native Russia in order to stay with her daughter, Victoria Melita, Grand Duchess of Russia. The last one of her trips took place in May 1914. At the outbreak of World War I, Maria Alexandrovna was in Coburg after returning from a visit to George V in Buckingham Palace. Her sympathies were divided, but she sided with Germany against her native Russia. The Coburg family faced intense hostility during the war for their British and Russian connections. The Dowager Duchess' position in Coburg became untenable as Russophobia took over the German Empire. To avoid complications, Maria Alexandrovna stayed away from Coburg retiring to Tegernsee in Bavaria. At one point, while she was returning home with her two younger daughters, their car was stopped by an angry mob who recognised her and harassed her for her Russian heritage. It took the police over an hour to extricate them from the situation. After that incident Maria Alexandrovna went to live in exile in Switzerland at the Walhaus, an annex of the Dolder Grand Hotel in Zürich. In August 1917 she wrote: "At the age of 63, I am very fresh in mind, if not in body, and I can support with patience and resignation a sad and perhaps miserable end of life which is in store for my old age... Sometimes I also seem to despair, but not about myself, but about the state of things in general." Many of the Grand Duchess' relatives were killed during the Russian revolution, including her only surviving brother Grand Duke Paul and her nephew Tsar Nicholas II with his immediate family. In the aftermath of the war, the Dowager Duchess lost her large fortune as the bulk of it was held in trust in Russia. Her British income was small, and as she never saw a penny of it, she was forced to sell great part of her jewellery collection. Living under reduced circumstances in Zürich, Maria Alexandrovna was reunited with her two eldest daughters Marie, Queen of Romania, and Victoria Melita, Grand Duchess of Russia who had been on the opposite side during the war. In July 1920, she wrote: "I am too utterly disgusted with the present state of the world and mankind in general... They have destroyed and ruined my beloved Russia, my much-loved Germany". She was a broken woman, her figure, always plump, became thin and her hands trembling. Although she had been affected by gastric troubles, her death came unexpectedly. Eight days after her sixty-seventh birthday, on 25 October 1920, the only child of Tsar Alexander II to survive the Russian Revolution died in her sleep of a heart attack. She was buried in the ducal mausoleum at Friedhof am Glockenberg in Coburg besides her husband and their son. " She was profoundly religious", her eldest daughter wrote, "I hope God will not disappoint her as most things and beings did in this life". 1 2 Beéche, The Coburgs of Europe, p. 82. ↑ Beéche, The Coburgs of Europe, p. 83. ↑ Laß, Heiko; Seidel, Catrin; Krischke, Roland (2011). Schloss Friedenstein in Gotha mit Park (German). Stiftung Thüringer Schlösser und Gärten. ISBN 978-3-422-023437. ↑ Beéche, The Coburgs of Europe, p. 84. ↑ Beéche, The Coburgs of Europe, p. 120. ↑ Beéche, The Coburgs of Europe, p. 85. ↑ Beéche, The Coburgs of Europe, p. 116. 1 2 3 Beéche, The Coburgs of Europe, p. 222. ↑ Beéche, The Coburgs of Europe, p. 86. Van der Kiste, John. Alfred: Queen Victoria's Second Son. Fonthill Media, 2015. ISBN 978-1781553190. (Kindle ed.). Van der Kiste, John. The Romanovs 1818–1959. Sutton Publishing, 1999. ISBN 0-7509-2275-3. Wimbles, John. The Daughter of Tsar Alexander II. Published in The Grand Duchesses. Eurohistory.com, 2014. Zeepvat, Charlotte. The Camera and the Tsars, Sutton Publishing, 2004. ISBN 0-7509-3049-7.